It may seem strange to be reviewing a book in the “Complete Idiot’s” series (books that provides a basic understanding of a complex and popular topic) because for many, the “Complete Idiot’s” moniker may leave the impression that the content is dumbed down for its intended audience. While there is no shortage of books for those considering the plunge into self-employment, “The Complete Idiot’s Guide to Starting Your Own Business” is the right book for a prospective business owner because of its overall thoroughness and lack of agenda. When I say lack of agenda, I’m referring to author Ed Paulson’s well-presented nuts and bolts approach that is unlike many start-up primers, that are full of self-promoting stories that say more about the author’s ego then business. Paulson counters this trend with a solid overview that is honest about the risks and rewards of starting a business, while providing the details on how it can happen successfully. The book begins in the right place with sections on assessing if you are the type of person well suited for starting a business. Choosing the right type of business is discussed at length, but is also made clear that it’s not just the type of business that will work for your personality and lifestyle that’s important, it has a lot to do with quantifying the potential market is for the concept (and if that market can generate the sales to make it work financially). This is where so many aspiring entrepreneurs make their fatal mistake, falling in love with the product or concept and charging full steam ahead before they realize the market is not large enough. Dalton explains all of this in a logical well thought out manner that tends to not overwhelm. For those who shy away from numbers and financial analysis, “The Complete Idiot’s Guide to Starting Your Own Business” does a tremendous job with estimating start-up business costs (and yes, they are always higher than you think), explaining the essentials of income statements, balance sheets, and cash flow statements (again without being too overwhelming). And then there is the business plan. Another one of my complaints about start-up business books is their immediate urge to have one sit down and write a business plan. Business plans are important for the guiding a business, attracting investors, and long term success, but making it an initial priority isn’t always best. The author understands this and instead works in a more concise way to see if the business is feasible. Again are there enough customers to sell to, and will the product or service produce enough in revenue to be successful? 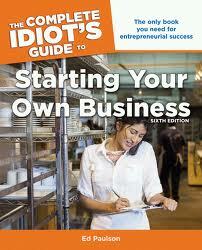 Despite the minor deductions, “The Complete Idiot’s Guide to Starting Your Own Business” is an excellent starting place for those considering the plunge into business ownership. Once read it becomes a valuable reference guide to come back to, again and again. I appreciate your distinction between a feasibility test and a full-on business plan. Thanks for another excellent review! With out your review we will never know about this fantastic books you wrote about. This is the next in my list, first is “A Slice of the Pie”. Keep up your great job.